For one lap yesterday at the Daytona International Speedway, a 72 year old driver led the NASCAR pack. Racing legend Richard Petty was back in a familiar position at the start of the Daytona 500 on Sunday. 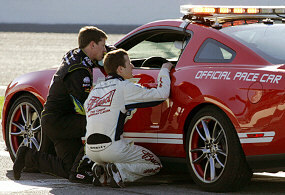 But rather than strapping into a ride stenciled with the fabled #43 and doing 200 laps on the Daytona oval, Petty piloted the pace car, a 2011 Ford Mustang GT. Richard Petty Motorsports, which recently acquired Yates Racing, has returned to the Ford Racing family for the 2010 Sprint Cup season. At the end of the first lap, the green flag waved, and the field split around the pace car. King Richard eased the Mustang down pit row, and the strange race that followed, marred by long stoppages for track problem repairs, was underway. 2/25/10 update: Here’s a video from Ford Racing of the pace lap, and comments from Richard Petty – pretty cool! Ford Racing has a rich history at the Daytona 500, having taken the checkered flag 11 times, most recently by Matt Kenseth in 2009. 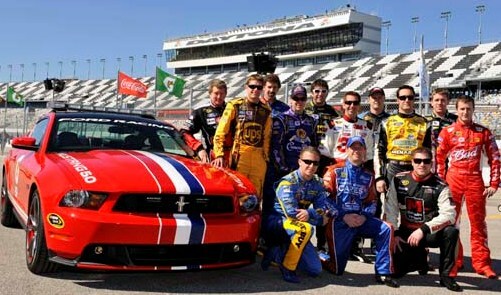 And, as if any of the 13 drivers on the Ford teams needed an extra incentive to win at Daytona this year, Ford Racing upped the purse ante – win the race, get a replica pace car – one of only 50 being built. Alas, Jamie McMurray held off a last-lap charge from Dale Earnhardt Jr. to win the marathon race. The Ford Racing team, led by Greg Biffle in third place, captured 3 of the top 10 finish spots. On January 23rd, the actual 2011 Mustang GT Daytona 500 pace car and a sweet swag package, including a first class trip to Daytona, were auctioned at Barrett-Jackson in Scottsdale, Az. The auction fetched a final bid of $330,000, with proceeds from the sale being donated to the Juvenile Diabetes Foundation. American Muscle is celebrating Mustang’s return to the 2010 NASCAR season with this collection of popular track-themed parts. Check it out – and get your own Mustang ready and buzzworthy for spring! He was in the car , but not driving.. I thought that was crappy..
Richard should have been driving.. Point blank! I missed the start of the race, did anyone else see it? If this is true, it’s an insult to the greatest stock car driver of all time. And if it’s true, who’s writing all this BS about Petty being the driver? ?